Adjusts 22" - 34" in 1" pin-set increments. Sierra comes in an equally sleek pin-set version. A smart alternative in settings where only the occasional change in seated height is needed. For today's multishift, job-sharing offices, the WorkRite Sierra Pin offers maximum flexibility and exonomy in the seated position. In typical office environments where employees move frequently, the Sierra Pin permits facilities personnel to quickly and easily calibrate each workcenter to its new owner. 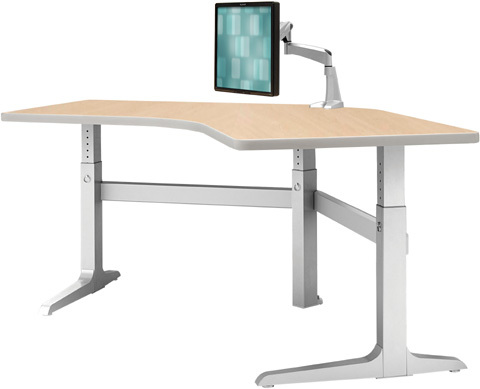 Readily adjust the height in 1" increments to achieve full 5th - 95th percentile height range support for seated workers. With 250 pounds of support in over a dozen shapes and our full range of laminate and trim options, the Sierra Pin is a sturdy stalwart for virtually any office. All Sierra Electric workcenters exceed LEED requirement MR4.2 (20% recycled content) with a minimum of 42% LEED recycled content, and 35% for base only models.